This, our second NID, we were accompanied by another member from Braunton Caen, Paul Cockcroft and his wife Jane. One further member, Peter Cross from RC of Asburton/Buckfastleigh attended from D1175, 60 in total from across the UK who went to 3 different locations. 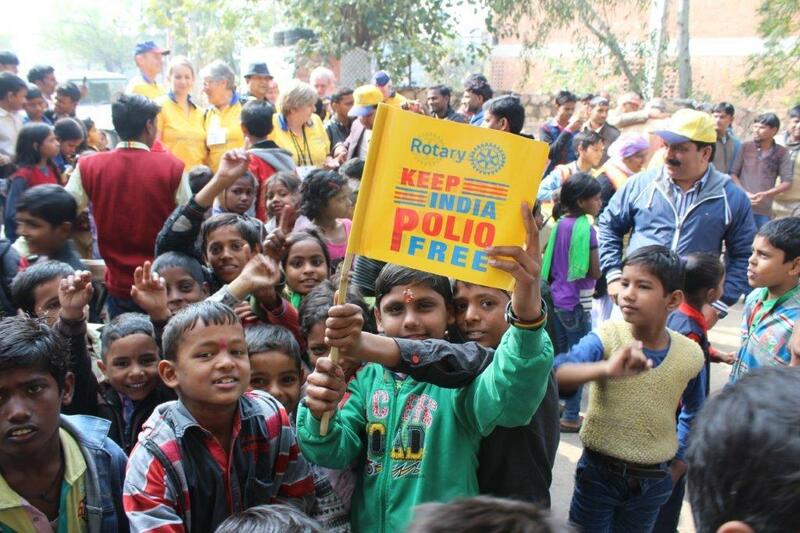 Our group of 20 Rotarians departed Delhi after a briefing by a member of the India National Polio Plus Committee and arrived on Friday afternoon in Bhiwadi, Rajasthan, welcomed very enthusiastically by the three Rotary Clubs and the Inner Wheel Club in Bhiwadi. Later we attended a “family meet”, an evening function where we witnessed the presentations of 5 “multi PHF awards” to local Rotarians, which were followed by the donation of gifts, dancing and hot food. Such generous hosts who made us feel so welcome. The following day, Saturday, was very full and varied as we promoted the national immunisation campaign in Bhiwadi. We were split into 3 groups and taken to local schools which are supported by Rotary. On regrouping, we spent most of the afternoon visiting various service projects sponsored by the Bhiwadi Clubs. These included Moksha Dham - a rotary sponsored and supported Hindu Crematorium, and an e-learning project. Another of the projects was Balwadi (Bal = small children, Wadi = a kind of home), a school for street children, who are educated and brought up to a required standard so that they can then be introduced to regular schools. It was also a vocational training centre for their mothers who were learning Henna decorations and dress making skills using hand operated sewing machines whist sat on the floor, which would enable them to support their families. The club also sponsor an Ambulance. Our final official activity of the day was a visit to the Government Hospital to meet the Chief Medical Officer of Health - the man responsible for the organisation of tomorrow’s NID. This was where the vaccine was stored until the day and then distributed in cool boxes, many of which were ready for packing the following day. An important part of the briefing was to ensure we all understood the need to keep the polio vaccine cold when we were administering it. All polio vials had a themo-sensitive marker on their side which changes colour if the vaccine starts to get warm. That evening we were hosted by the President of Inner Wheel (who was also a Rotarian) in her home. We were entertained by her entire family who impressed us with their genuine warmth and hospitality. The NID started at the District Hospital and as we arrived, the Polio Vaccine was already being distributed from the hospital, some leaving on motorbikes, others on foot, all carrying the insulated containers. After the many inauguration speeches (the Indian way!) and the first official ceremonial vaccine was given to a child, we set off by coach to our first vaccination station which was on the side of the road in the middle of a nearby suburb of the town. Our brief was to flood an area with vaccinators ensuring that every house was visited, every street was gone up and as much noise was made as possible. We were brightly dressed in yellow t-shirts and caps and we attract far more children to vaccination booths than is the case if they are staffed only buy local healthcare workers. At every booth, we were mobbed with children and their parents seeking vaccination. Many older brothers and sisters brought their young siblings with them to be vaccinated. On vaccinating, the children receive a small present such as a balloon or pencil. We visited 9 booths in total, starting with the poorest slum areas – to tented areas – to flats – and finally on to newer high-rise flats occupied by the wealthier Indian families. It is difficult to estimate how many children our group vaccinated, but we were to learn that last year we had increased the immunisation uptake from 30-35% to 60-65% on average in each booth. This year the numbers were even greater as the quantity of vaccines at each booth had been doubled in anticipation and we still ran out. On the follow-up day, we started at a Bangladesh migrant camp in the town, who earned a living by collecting anything thrown away which can be sorted, recycled and then sold.Despite their poverty and very basic living conditions, everyone was very pleased to see us. Having completed vaccinating here, we went off to our last Rotary sponsored project where cows who reach the end of their useful life are cared for on a farm. We were shown the biomass project, where the gas collected is stored and used for cooking and lighting.We were then bid a fond farewell by our Indian friends and returned to Delhi for the next stage of our adventure. Paul & Jane experienced a similar time in Delhi, being joined by hundreds of pupils from a local Public School for a Polio Awareness Rally, a vibrant, noisy and colourful parade around the streets with floats, band, singers and dancers - a cacophonous event with loud chanting of “Keep India polio free!” It certainly raised public awareness of the impending immunisation programme. That evening the Delhi volunteers were hosted at a dinner by one of Delhi’s many Rotary clubs. The next day, Paul and Jane, accompanied by a local Rotarian went to Delhi’s Garden where they assisted health workers at two different immunisation “booths” to immunise children from the poorest communities. They themselves immunised over 120 babies and youngsters. That afternoon they visited the Rotary supported Polio Corrective Surgery and Rehabilitation Project at St Stephens Hospital, witnessing the remarkable work there enabling polio victims who have never been able to walk previously, to walk for the first time with callipers, crutches or even unaided. The following day, the group went door-to-door in another area of extreme deprivation to find children who had not attended the booths the previous day. It was a truly humbling experience to see the impoverished conditions in which some Indians are living. Later that day they also visited other Rotary projects including a Diabetes Centre and a school for under-privileged children. Donations on behalf of the Rotary Club of Braunton Caen were made to a number of the charitable undertakings we visited.